A male and female mallard. The term “mallard” has often been used to describe any duck that is found in the wild, but is actually an official term used to describe a specific species of duck, the Anas platyrhynchos. While mallards are a type of wild duck, this does not go to say that every duck that is found in the wild is a mallard. While not a native species to all, the mallard can now be found on every continent in the world except for Antartica, and is especially comfortable in the subtropical climate of South Florida. Most all domestic breeds of ducks in the world today are descendants of mallards, so it could be said almost every duck you encounter in the wild has at least a little bit of mallard blood in it. Mallards are a medium-sized waterfowl species, averaging in lengths of around two feet and with wingspans of around three feet. Females are mostly mottled in various shades of brown and tan, leaving them virtually indistinguishable from other species of dabbling ducks. Male mallards, however, are quite a site to behold. Most notable for their glossy green heads, white collars, pale grey bellies, and black and white tipped tails, the males are arguably the “prettier” of the two genders. But while certain characteristics can be associated with both male and female mallards, the malleability of their genetic code allows for quite a range of variation in appearance between ducks of the mallard species. What makes mallards unique from other waterfowl species, and from much of the Florida Everglades wildlife in general, is that while most species tend to suffer and decline in population from their interactions with humans, mallards have actually benefited. These ducks are highly adaptable to a variety of surroundings, including heavily populated areas and areas of urban development. In fact, in addition to being found throughout the Everglades, they are also quite common around ponds and lakes within housing communities and commercial centers. 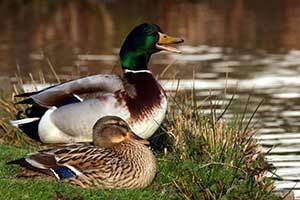 But while it can be argued that mallards have benefited from their relationship with humans, it can also be said that humans have not benefited from their relationship with mallards, but most importantly, the species hurt the most by mallards are other types of ducks. Mallards are capable of breeding with nearly all other types of ducks, and are considered an invasive species or pest in many areas where they can be found, because of what is called “genetic pollution.” The idea behind this concept is that, because mallards hybridize with so many other species, it creates conservation concerns for specific species of duck that are already in danger. After enough hybridization, the original species will cease to exist, essentially causing the possible extinction of a variety of exotic and domestic duck species. Though you likely have observed some form of mallard in the wild before, more than likely at the local park or perhaps even in your own backyard, mallards can still be appreciated while taking an airboat tour through the Florida Everglades. Florida swampland tours are not only a great opportunity to view the local winged wildlife, but you can also observe many of the local mammals, amphibians, and lizards too.